From catching venomous snakes as a child to searching the wild for animals thought to be extinct, Animal Planet star Forrest Galante has a story (or ten) to tell. Q: Hi Forrest! Tell us about yourself and how you got into wildlife adventuring? I grew up in the Southern African Bush of Zimbabwe Africa. When I wasn't on safari with my family, which is what they did, I was living on a farm so I’ve been surrounded by wildlife my entire life. In fact, I’ve been involved with wildlife from a very young age when I used to catch and sneak venomous snakes into the house without my parents knowing. Now I do it professionally! Q: What is wildlife adventuring? How does it differ from people just encountering wild animals? I don't know that there is a specific difference for wildlife adventuring. I'm a scientist, a wildlife biologist by trade, and I've taken that biology to an extreme level where it's an adventure to do the type of surveys and studies that I do on an ongoing basis. A biologist may conduct a survey in one location for a short amount of time, but as a wildlife adventurer, I conduct lots of surveys in extremely remote places throughout the world. Oftentimes no other people have ever been there, let alone a western academic. Q: Your Animal Planet TV show Extinct or Alive is fun and crazy. How did you come up with the show idea and what's the craziest experience you've had while filming the show? You’re right, Extinct or Alive is fun and it’s crazy. The idea came when a producer approached me and said, "Hey, you're a crazy wildlife biologist and I love the stuff you do, I have this idea for tracking down supposedly extinct animals, do you think any of them could still be alive?" I turned to him and said, "As a matter of fact I know that some of these ostensibly extinct animals are still alive because my grandfather discovered a coelacanth that had been thought to have been extinct for 66 million years. If he can find that, I'm certain that we can find some of these other not-really-extinct animals." That's how the show came about. The craziest experience I've had, well, it’s a long list, from climbing treetops in the Madagascan jungle canopy to chasing giant lemurs to repelling down thousand foot cliffs to seeing the grind at Wale Slaughter in the Faroe Islands. There have been a lot of ups and downs, high and low moments! If have to pick just one, though, the craziest experience was actually uncovering evidence of the Zanzibar leopard, a large 100 pound cat believed to be extinct for over a century. That was the pinnacle of my career, and was by far the craziest and best experience. Q: You are known as the perfect combination of Steve Irwin, Bear Grylls and Jacques Cousteau. Can you tell us what inspires you about each of these three adventurers? I think the names speak for themselves. Steve Irwin is my original hero, the king of wildlife media, the man who entertained us all by showing how incredible wildlife can be. He is just a legend. Bear Grylls and his survival knowledge, his showmanship, his expertise in the outdoors and getting through tough situations is unparalleled and he's just the most entertaining guy that's been on television in a long time. Jacques Cousteau, what a hero of underwater adventure. His discoveries beneath the surface are unparalleled, he is an incredible adventurer, incredible seaman, ocean explorer, a six-time world record holding freediver, spear fisherman, hundred-ton ship captain, and dive master. I feel like all of my accomplishments just pale in comparison to anything Jacques Cousteau ever did. These are three truly inspirational men, and to be considered a combination of those three is tremendously flattering. Q: What pets do you have? We expect that they're probably quite exotic and possibly numerous too. Hang on to your hat! My wife calculated that I have 91 pets, though that includes our pond which has over 20 turtles. We also have a miniature horse, a miniature donkey, a miniature pig who is a rescue from Hurricane Katrina, a giant cicada, various tortoises, peacocks, guinea fowl, turkeys, chickens, giant Flemish rabbits, dogs and snakes. I have two snakes that I'm looking at right now on my computer desk. Oh! And a bunch of hermit crabs too. It's a long list and they're almost all rescues, something that we love to do. We also love taking care of them too. Q: If you could travel anywhere on the planet for your next adventure, where would you head? The number one place on my bucket list right now is the Pantanal. It's in the Brazilian Amazon and is the largest wetland in South America. Clear water, giant caimans, fresh water turtles and huge anacondas, not to mention jaguars and all the crazy South American fauna. I've been to South America before but I've never made it to the Pantanal, so that is top of my list at the moment. Q: When you're not wrestling dangerous and exotic creatures, what's your day job? This is it! My day job is planning for the wrestling of dangerous and exotic creatures. I spent tons of time doing research, investigating stories of extinct creatures, looking at these critically endangered animals, and time-sensitive situations, and then I work towards funding, financing, filming and exploring them all. My day job when I'm not in the bush is planning how to get back into the bush. Q: What’s your favorite Nite Ize product and why? Oh man, this is such an easy one for me. It's the INOVA® T10R™. It is the greatest flashlight on earth. I mean it’s unbelievable how bright it is and how well it works. Mine's been underwater, through torrential downpours, dropped in the mud, dropped off cliffs, and it keeps going. It's absolutely bulletproof and that intense spotlight beam is the most essential tool that I have for spotting wildlife at night. If I walked through the jungle at night looking for things up in the canopy without that INOVA T10R, I would be unable to spot half the animals that I’ve identified in the last year. People love the flashlight, too. Thanks to your team at Nite Ize, I've been able to share it with three or four different crew members and they all say it's now one of their most valued possessions. I cannot recommend that flashlight enough! After the T10R, Gear Ties® are a huge win too. Heck, Gear Ties hold my life together. From the cable that is currently attached to my iPhone with a microphone on it, to cords all around my house, to keeping spear guns together on my boat, to strapping things to the struts of helicopters, I use Gear Ties for everything. They are in every corner of my life! Q: What else is happening in your world, Forrest? My passions are deep and intense. I'm an avid rugby player, love the game and coach youth rugby. I do a lot of freediving and spearfishing. I harvest all of my own edible proteins sustainably from the ocean and do a ton of mushroom foraging too. And I use Nite Ize products for all of it! Whether it is the INOVA flashlight or the headlamps or the Gear Ties to hold my dive gear together or the GearLine®, all of it is super valuable to me and I'm so grateful to have your support and innovations. Thank you guys! Q: Great stuff, really fun to talk with you. How can people keep up with your adventures and find you on social media? You can find me as @Forrest.Galante on Instagram, @ForrestGalante on Facebook and @ForrestGalante on Twitter. I do have a YouTube channel. It's mostly diving and spearfishing related, but I’m much more active on the other three channels. And then there’s the TV show. Check out Extinct or Alive on Animal Planet. It's available on Animal Planet Go or Amazon at any time. It's a great show, it's family friendly, it's fun, it's an adventure show and it inspires hope and conservation. Kids love it, adults love it. If you're into wildlife, if you're into adventure, please check it out! Nite Ize Field Team member Colin Sanders accomplished a feat most would consider impossible when he rowed for 83 days straight to cross the Atlantic, alone, in a rowboat. We were able to talk to him about his adventures, struggles, and triumphs -- and about how this massive goal was fueled by wanting to help others. Q: Hi Colin! First off, tell us a bit about yourself. How did you get into ultra long distance rowing? About four years ago I decided I needed a grand adventure, something that would challenge me physically, mentally, emotionally and even financially. I spent a lot of time skiing in the mountains when I was younger and always suffered from the altitude. Climbing Everest was out. To be honest, climbing Everest seemed mundane in some ways anyway, since thousands of people have summited at this point. Solo rowing the Atlantic was different and definitely more unusual. Few have done it and it fit my personality better. When people ask me why I rowed across the Atlantic Ocean my answer is typically “ego and self-gratification”. Sometimes I wish there was a more profound motivation but at age 64 I think I had something to prove to myself, that I could take on something incredibly tough and succeed. Q: How does a multi-week rowing journey work? Do you row for 8+ hours a day and rest the other 16? Heck, don’t you drift while you're not rowing? I rowed for 10-14 hours each day. At the beginning of the trip I had a routine where I rowed for three hours then took 15 minutes off. Again and again. As I got further across the ocean and started to wear down physically I had to shorten the shifts and take more frequent breaks. I would usually start just as the sun was rising because rowing in the dark just isn’t fun, particularly when the seas are rough. When I stowed the oars at night I just drifted. Depending on how big and steep the waves were that evening, I had to decide whether to drift free, put a warp off the stern or para anchor. Note: A “warp” is a thick line that provides drag and some directional stability downwind and a para anchor, also called a drogue, is about the size of a bushel basket and gives the boat enough drag to produce excellent downwind stability. It was always a fine line because I always wanted to pick up as much free distance as possible by drifting and the MRE drag I had, the less I would drift. Insufficient directional stability downwind could end up turning the boat sideways to the wind and waves and even end up with the boat capsizing. And capsize it did. New Year’s Eve while the boat was on the warp. She got hit by a large wave as it broke and ended up rolling over and over several times. Anything not locked down flew everywhere, including a liter of olive oil! The boat righted itself but after composing myself I had to go on deck in the pitch dark - in a really choppy sea with big waves - to pull the warp in and set the drogue. Setting the drogue isn’t easy even in the smoothest of waters because it uses a bridle attached to each side of the stern, but in big waves, high wind and darkness? It was very tough. Q: How do you train for a rowing marathon like you did? You just rowed across the Atlantic Ocean! How on Earth did you prep for that? I had a really great trainer. It was a partly strength in the upper body, but a lot more about core strength and flexibility. We spent a lot of time on stretching to ensure that my back and core were the strongest possible. I actually spent very little time with an indoor rowing machine because it has little in common with ocean rowing when you often only have one oar in the water at any given time. Q: Your Trans-Atlantic journey was from Puerto de Mogan in the Canary Islands to English Harbour in Antigua. How did you choose that route and did you ever run afoul of whales, sharks or enormous cargo ships en route? Actually, that particular route is the classic course to get across the Atlantic Ocean. Originally, I was going to head for Barbados, but I just couldn’t get far enough south to make that a viable destination. Halfway across Stokey my UK-based navigator said, “You’re going to Antigua, mate!”. I did see the odd cargo ship but really not that many ships at all. Part of that is the vastness of the ocean: They could have been passing within five miles and I would have never known. In terms of wildlife, I remember seeing one pilot whale, lots of dolphins and several swordfish but no sharks at all. Q: What’s one aspect of the row that was the toughest? The emotional and mental side of the journey was the most difficult. Being completely alone for 83 days was hard, especially in tough sea conditions. The loss of my music 28 days out was a real blow to my emotional state too: I had spent a year curating downloads on Spotify, never realizing that you have to sign in every 30 days to keep the downloads active. I didn’t know that and one month into the trip suddenly had no music at all. I ended up giving monologues and speeches on a wide variety of subjects that I knew something about, singing songs, coming up with thought experiments, and trying not to go crazy out there in the middle of the ocean. It wasn’t easy, but I made it! Q: What's your favorite Nite Ize product and why? I started out with a lot of Nite Ize gear, but to be honest, it wasn’t until I was doing the actual row that I realized the excellent quality of all the products. The Gear Ties I used every single day. It was typically so rough at sea that it was critical that they quickly and easily secured equipment on the deck. I also used the S-Biner Marine to secure equipment that I viewed as “mission critical”, including my multitools and water bottles. They were on deck every single day and at the end of the journey none of them had a single spot of rust. I could hardly believe it, because so many other tools or pieces of my kit rusted or corroded with the constant salt water exposure. The Nite Ize equipment never, ever corroded! Q: Are you ready to circumnavigate the entire Earth in your boat now? What is your next grand adventure? Ummmm no. The Atlantic was enough at 4000 km (2485 miles). Not sure what my next adventure will be, but it’ll be something. I have lots of living to do yet! Q: Can you tell us a bit about your charity A Million Possibilities? I raised about $150K for Community Living Ontario. Community Living supports people like my son Jeff, who has intellectual disabilities. We came up with the name “A Million Possibilities” hoping to raise $1 for each stroke I took crossing the Atlantic. Ultimately, we didn’t raise a million dollars but we were still very happy with the results. Congrats on your remarkable achievement, Colin. We look forward to hearing about your next adventure! Q: Tell us all about yourself, first off. How did you get into hunting and fishing and what are your earliest hunting memories? Although I grew up in central Kentucky, I wasn’t a hunter as a kid. My parents and I had cattle and horses. The first time I even saw a deer near my home was when I was 16. I didn’t start actually hunting until I was in my early 20s. A buddy of mine at the police department where I worked came up with the idea. We didn’t have a clue what we were doing and a camera crew should’ve been with to film a comedy show. I stuck with it and after I had harvested a few deer, I decided to switch exclusively to archery equipment. I couldn’t imagine doing anything else in the fall now! I did grow up fishing in farm ponds, mostly catfish and bluegill. Quite frankly, that was a little slow for me or maybe the reward isn’t as big? But in the end, I don’t have the time to take on another hobby, because anything I do, it's FULL TILT, and I simply can’t do anything half-cocked. It’s gotta be all or nothing! Q: What's your favorite weapon for a hunt? 100% - just a bow. Although I did start out hunting with rifles and muzzleloaders, I have gone to exclusively archery gear for the last decade. It’s more of a challenge because typically your shots are within 30 yards. Part of the fun of the hunt is also me seeing how close I can get to the deer while remaining undetected. My thinking is that if I use a rifle and shoot a deer at 200-400 yards, that animal will never even know I existed. But at 30 yards, stand placement, sounds and scent all come into play. Obviously, there are some hunts that are extremely tough with a bow, but it has just become my style of hunting. Q: What specific things are on your list when you're preparing for hunting season? Preparation is key for hunting. Scouting and looking for sign in the woods is a lot of fun. I study the topography of the areas where I will be hunting and the surrounding areas. I plant food plots (beans, turnips, oats, wheat, corn) for the deer and other wildlife. Trail cameras have come a long way in the last 10 years and do a fantastic job of letting you track what’s moving through and at what times. Shooting my bow is really important to me. The goal is to always make an ethical shot. It’s hunting and it’s violent, there is no way around that. So, the practice I do ensures that when I take that shot, every effort has been put into making sure its the best shot I can take, the placement is accurate and the animal dies quickly. Q: Where's the most exotic place you've gone hunting or fishing? Montana! For a Midwest boy, going out west was awesome! The mountains and terrain are absolutely gorgeous. I have been hunting there twice for antelope with archery equipment. I was able to harvest a solid antelope on public land this past fall and spread awareness about state and BLM (Bureau of Land Management) ground too. BLM land in recent years has become subject to debate with the government trying to take away some public lands. I believe we are all public land owners, whether we are hiking, camping, fishing, hunting, or enjoying national/state parks. In a nutshell, public lands should stay in public hands. Q: What's Arrow Wild TV and who would want to watch it? Arrow Wild TV is a photography/media content company that has a web show. Instead of the traditional hunting shows that are on cable networks, we do more “real time” as the season unfolds. We show the shed season. Note: Deer shed, or drop, their antlers each year and it’s like an Easter egg hunt to try and find them. It’s especially cool when it’s a deer you’re familiar with or with whom you’ve had some history. Then we go into turkey hunting season, planting food plots, scouting, hanging tree stands or blinds, setting trail cameras, then finally the actual hunt. Its all 100% bow hunting only. We try to educate a little, show the ups/downs, the effort and the conservation side of hunting in lieu of just the harvesting side of hunting. The entire year as a whole is much more involved and intimate than most people who are unfamiliar with hunting would expect. Q: If you could travel anywhere on Earth for your next adventure, where would you head? I would have to say Alaska, New Zealand, Russia! Moose, Bear, Red Stag! I could go on and on. But there is so much of North America that I want to see and experience, I think I will stick to that for a while. Finances also keep me in the lower 48. So much of where/what I do is driven by this… I don’t have a fear of dying, that part went away during my 15 years as a police officer. I only have a genuine fear of dying before I accomplish everything I want to see and do. My favorite Nite Ize products are the flashlights, mainly headlamps, the Steelie line, and CamJam straps. I’m very active and always on the go, so to see where I’m going when it’s dark, and with social media work/maps on my phone, a Steelie to throw my phone onto and keep rolling, it’s all really important. Cinching down equipment and camera tripods so they aren’t rattling around is a plus too, and I think that’s the Nite Ize secret sauce, solving problems, one small gadget at a time. Q: “Solving problems, one gadget at a time.” Very nice. What else do you want to share? I have gained so much from hunting and met so many great, passionate people that I wanted to give back. I reached out to my local DNR (Department of Natural Resources) officer and became an Iowa Hunter Safety Instructor. It has been so awesome to teach safety to new hunters and, to steal a line from my DNR buddy, we are staying to teach about incidents too. Accidents happen and can’t be avoided. But incidents can! So, if we can teach the importance of wearing a harness when climbing into trees and teaching gun safety to hunters young and old, then maybe we can prevent these incidents from happening. I also have organized some donations to Quality Deer Management Association by designing a shirt I sold through Arrow Wild TV. The shirt said “#conservation / because simply buying a license isn’t enough” I gave 100% of the profits of the sales to the QDMA. What’s the old saying? Leave it better than you found it. That’s what I try to do every day, even if it’s just walking the public lands and picking up trash, or teaching hunter safety to groups. Q: Great stuff. Thanks. How do people find you online if they want to follow your adventures? My personal Instagram is @johnny.utah.hunt and Arrow Wild TV is @arrowwildtv I do have some short films and episodes on YouTube under Arrow Wild TV as well. Whether you’re a pro golfer or a weekend duffer, there’s just something compelling about hitting a little white ball onto the green and then rolling it into the hole. But golf isn’t the same game your grandpa played: Club technology has improved dramatically and even golf balls are carefully engineered for maximum loft and distance. Golf bags, scoring systems, tools to analyze the lie of the shot and distance to the green, they’re all new and can be darn helpful in the quest to better your game. Modern golfers also end up accumulating lots of gear, which means that there’s an inherent challenge for every player: how to keep it all neat and organized? That’s where Nite Ize can help with a wide range of products perfect for golfers, whether you’re on the links every day or just once or twice a month when you can fit it into your busy schedule. One of the most helpful tools is a device that’s all too easy to lose: a pen. Sure, you can keep score with your smartphone, but it’s so nice to just turn off that pesky digital leash and enjoy a few rounds with your friends. Enter the Inka® Key Chain Pen. It’s perfect for every outdoor activity with its compact size, reliable ink system, and keychain-style loop that can be easily attached to a golf bag. Smart golfers also have a second hooked to their keys, because if you’re landing those double eagles, you definitely want to be keeping score! Nite Ize has a lot of other useful gear for the inveterate golfer. S-Biners® are a splendid way to attach bigger items to your golf bag - like your golf towel or that white flag you want to wave when you’re ready to surrender to the green! - and Gear Ties® can ensure that your golf bag stays put in the back your car en route too. If you like to save money on greens fees by golfing early into the evening, a few Glowsticks and a Radiant® 3-in-1 LED Flashlight can help you keep track of all your gear. Or get an early start on the post-game festivities as you’re heading back after getting an eagle on the 18th hole. The best Nite Ize product for most golfers, however, is one that is all about practicality: the Traveler™ Drink Holster. After all, who wants to spend a day on the golf course without some sort of refreshment along the way? However you play golf and whatever level of gear you have, Nite Ize can enhance your time on the course with our wide variety of different solutions. Check them out, you’ll be improving your game in no time! Growing up in Southern California, many of my best childhood memories are tied to being at the beach. Whether it was Santa Monica beach, if we wanted to be down by the pier, or Zuma and Malibu beaches, which were the two just down the canyon from our neighborhood. If you’ve never grown up near a beach community, you don’t know that high schools have designated lifeguard stations, too. On Zuma beach, my local high school had our station and it was a fun way both to find friends and avoid the kids from the rival cross-town school. While we occasionally just lay on our towels and listened to music on our boom boxes, mostly everyone was up and about, walking around, playing football, body surfing, splashing in the water, or swimming. Hands down one of the most popular activities, though, was throwing a flying disc back and forth. For hours and hours. Back then, flying discs were just lumps of plastic without much going for them. So we all had a stack in our cars, so that the loss of a disc in the surf wasn’t going to stop the show. Still, once the sun started to set, that game was over because you can’t play when you can’t see the disc zipping towards you! 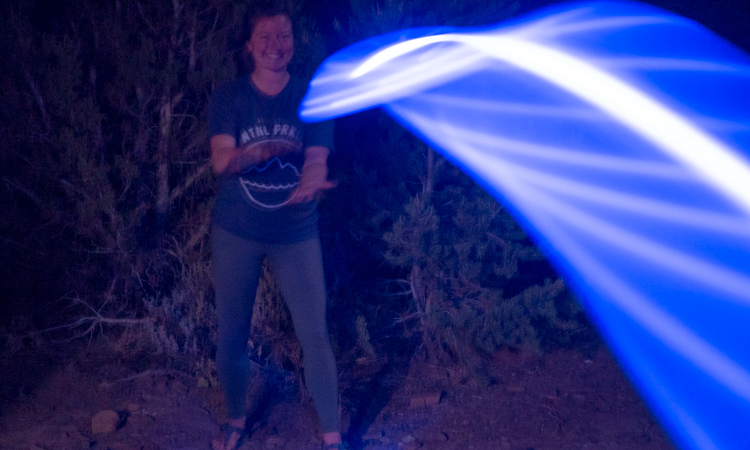 That’s why the Flashflight from Nite Ize is so incredibly fun: It’s a well balanced and easy to throw flying disc that lights up, making it perfect for nighttime play! For those of you that measure discs by weight, it’s a 185g disc, so it’s got some heft to it. This means you can throw it further and catch it easily as it has a nice, deep lip. But it’s the colors that make the Flashflight so darn fun. When I headed out to the street one evening with my kids to try out the color-changing Disc-O Flashflight, we all instantly became fans of this great flying disc. You can watch it transition from one color of the rainbow to another, even as it’s zipping from person to person. The tech is also a lot more sophisticated than it appears at first glance: the Flashflight is built around a patented LED and fiber optic system that makes the light-up disc look somewhat like a psychedelic jellyfish. It’s also quite durable - skittering along the road didn’t ding or scratch up the disc - and it’s also water resistant and floats! Where was this when I was on the beach every day? My kids have been playing with the Flashflight quite a bit and now are insistent that it travel with them to Hawaii for their summer vacation. There’s no doubt about it, the Flashflight will be absolutely perfect for play on the beach once one of those glorious Hawaiian sunsets wrap up. When you live in a van in Colorado and the sun dips below the horizon, you have two options: Get in and enjoy that claustrophobic feeling of being in the same small space for far too many hours, or grab some Nite Ize products and keep the fun going. With the fire ban stretching across the state, it’s easy to get discouraged after sunset in the backcountry. Without a fire to base evening debauchery around, what’s an outdoor enthusiast to do? Luckily, Nite Ize has plenty of products to help keep you entertained. Check out some fun post-sunset products perfect for both humans and furry friends alike. 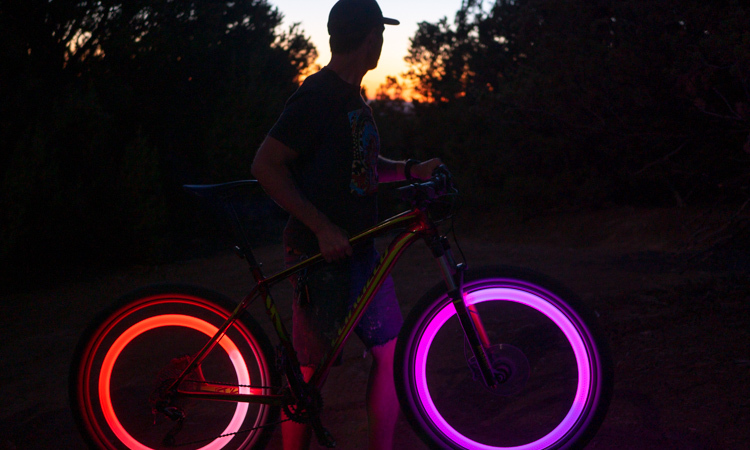 Nothing says “I’m keeping myself safe, but I’m here to party” quite like the SpokeLit LED Wheel Light from Nite Ize. The SpokeLit is an LED lighting accessory for all occasions. And we mean ALL OCCASIONS. You can select between six colors or leave it on the color changing Disc-O mode to keep you seen and safe with perfect side visibility while riding your bike. Biking home from work? SpokeLit. Biking to the bar on a Saturday night? SpokeLit. Biking across the desert at Burning Man? Definitely SpokeLit. This shock and weather-resistant light is super efficient and has a battery life of 20 hours (roughly the length of one REALLY GOOD party). In all honesty, it just makes riding your bike more fun. We’ve even used ours along with a headlamp while mountain biking at night. We usually select our color based on our mood… Which is almost always Disc-O mode. When we’re backpacking we choose food with a high nutrition-to-weight ratio. When we’re in the van, we choose our toys with a high fun-to-size ratio. The Flashflight LED LightUp Flying Disc always makes the cut. 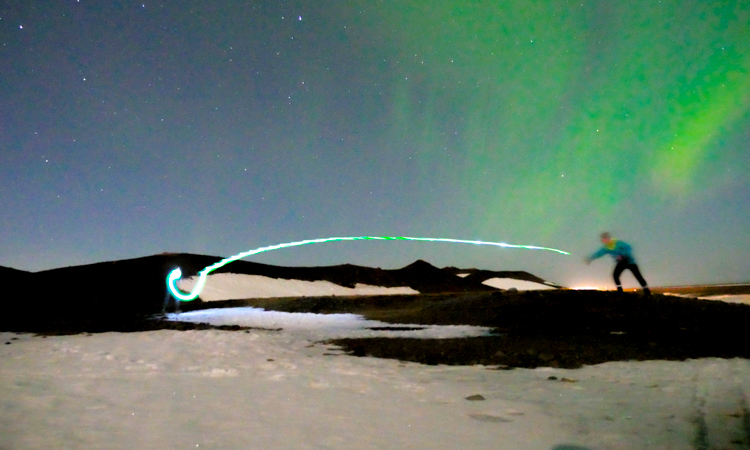 The Flashflight is a LED Light Up flying disc designed by an Ultimate player to perform as beautifully as it looks. Weighing in at 185 grams, the Flashflight is our go-to for fun, whether we’re in the van or spending a night in the backcountry. The Flashflight is not only water-resistant but it floats, too! Nite Ize incorporated fiber optics as well as long-life LED lights into the Flashflight to make sure you can see it from every angle. Obviously, it’s great at night, but it was designed to fly like a high-quality flying disc and you’ll be reaching for it even during the day. We often play fetch with our van pooch after dark, and before the Huck ‘N Tuck Glowstreak Collapsible Thrower and LED Ball, we lost count of all of the tennis balls that were lost to the night. 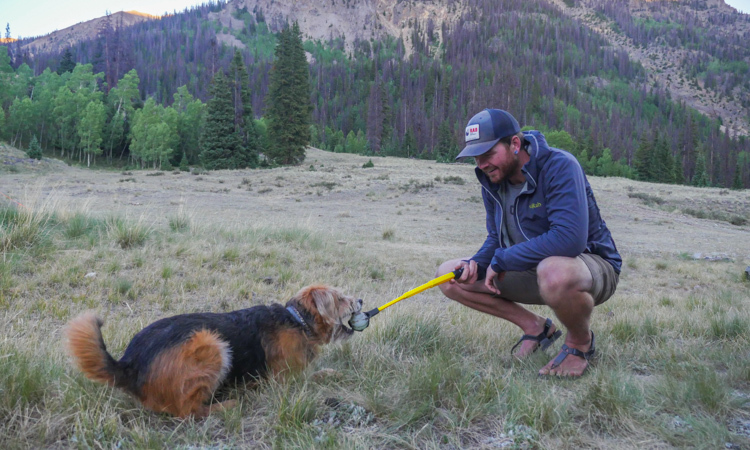 With the LED ball, and easy to store thrower, we can tire our puppy out every night after finding camp. The Huck ‘N Tuck thrower extends to two-feet long for long arching throws, and collapses down to 12 inches so it’s easy to store in the van. The motion-activated LED ball comes to life with a bounce against the ground or the first throw, and keeps glowing until it’s stationary for five minutes. You get five more minutes of the LED’s blinking before it turns off. This ensures you can find the ball even when your pup is done running. That strong little LED has 35 hours of glow time so you can play throughout the entire summer. The LED ball is molded, shockproof AND waterproof (and it floats!). This means if you have a pup that likes to swim, you can keep the water games going all night. The ball has ridges so it won’t slip as he makes his way back for another throw. It is also the same size as a tennis ball so it’s compatible with all throwers! Our dog has put this ball to the test, and it’s stood up to his slobber, chewing and his incredible ability to hide the ball from us when we’re done playing. We have an adventure dog. He sprints along as we bike down singletrack, secures the perimeter every time we arrive at a new campsite, and scrambles up rock fields as we make our way to summits. This dog knows freedom and yearns to roam like the rest of us. 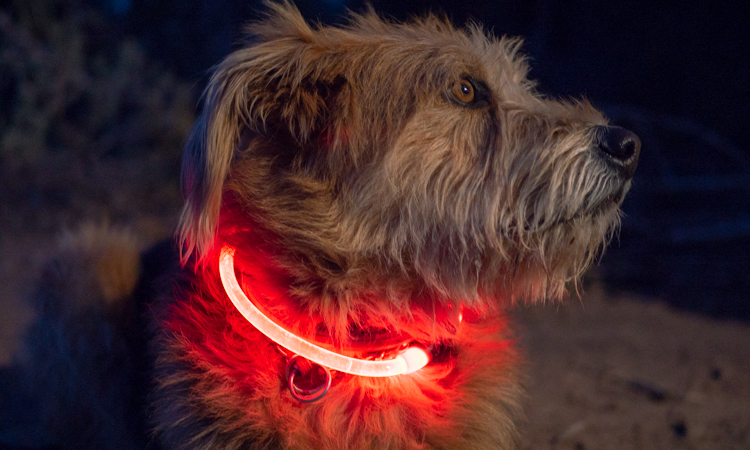 When we arrive at camp, we instantly reach for the NiteHowl LED Safety Necklace. The collar is made up of flexible polymer which you trim down to fit your pup’s neck exactly. It comes in three different colors so you can easily distinguish between other dogs wearing the same collar. The button on the weather-resistant battery pack cycles you through solid lights, flashing and off. We use the flashing mode when walking through crowds at festivals to make sure our pup is seen, and so everyone else knows he’s ready to party. At campsites, we use the solid option so we can always spot him (and he’s still ready to party). Sometimes it’s catching glimpses of him sprinting through the trees around us, or as a glow reminder he’s curled up next to our camp chair snoozing once he’s partied out.